It’s only been 12 days on the road. When we left home, we were hoping our 2nd tour across Canada would be as full of life as our first. The innocence and enthusiasm of trying something for the first time can sometimes skew the reality of what really happened. History gets romanticized and edited, leaving only the “shiny’ moments. When it was our first time getting out and chasing our dream, we started believing we were going to catch it! When we started believing we were able to catch our dream, we started feeling like we were finally living. Every place was new. Every moment was a story that we couldn’t wait to share with our friends back home. There wasn’t a mundane event, ever, in the everyday – even sitting in a laundromat became inspirational. Our wide eyes and open hearts started finding inspiration everywhere. We were inspired by the kindness of fellow travellers camping in parking lots (FYI: sharing a fresh brewed cup of coffee is grounds – pun intended – for lifelong friendship). We were inspired by the hardware store employee that helped with a small repair on our van. We were even inspired filling up at a gas pump in the middle of nowhere. A random conversation with a total stranger led to her offering us a place to stay when we got to the next town. There was a story in every moment of everyday. Every day was shiny. That was our first tour. Now we are out on our second tour. We’ve been on this highway before, filled up at that gas station, seen that statue, and bought groceries at that same store. Has touring already become less momentous? I can tell you, with all honesty – absolutely not! 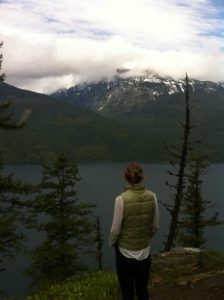 The familiarity of revisiting places brings us a comfort, almost a home away from home. Recognizing faces in those places makes it feel like we are among friends. In some cases, it can be like a reunion – and there’s always stories shared during and after a reunion! So this tour, like anytime one travels, with it’s share of familiar and new, has it’s stories. Our first night on the road, we performed at Mama Sita’s in Winlaw, BC. A small diner in a small town, if you can call it a town, it’s more of a corner on a scenic highway. We were greeted with a warm welcome from Natasha and Gemma. Then we saw “Lacey” from the CBC show Corner Gas! I was actually starstruck. I wish I got an autograph. But she gave us a smile as she made her way out and that’s still pretty cool. We also met a guy named Elvis. 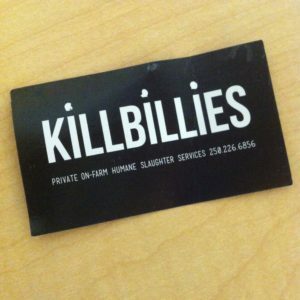 He runs a mobile slaughtering company called “Killbillies” – cool name, right? It sounds like a terrible job but for a small local farmer, Elvis is worth his weight in gold. We sat down and, over a pint of beer, he explained what he does and how he does it. He does it humanely, which he is certified for, and he does it at an affordable price. What he really does is helps get local food onto local tables. Farmer The Band likes Elvis! Then at the end of the night, we retired to our van and slept in the parking lot while the rain danced on the van roof. Well, “danced” is not really what it was, more like a bunch of raccoons in wrestling match, but less rhythmic – and that’s another story! So that was our first day on the road. There’s so many memorable moments that happen to us on the road. I could write a book and the tour is just starting! 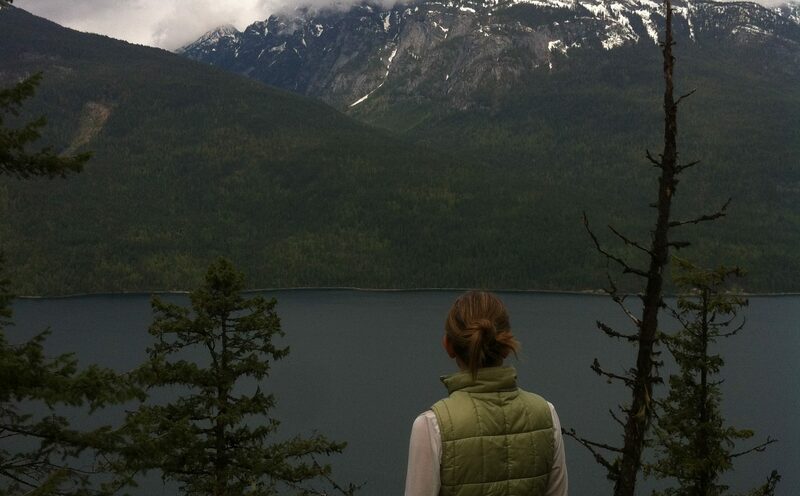 But really, it’s not being on the road that provides us with these experiences, it’s just being open to them. What’s labelled normal or humdrum is really only because that’s how we choose to see it. What you see is what you get! Not every minute of every day may be a magnificent tale to tell around the campfire for generations… or maybe they are. We just have to have our heads up, our eyes, ears, and hearts open to those experiences. I’d like to share more stories of our life on the road, which there are many, and I will, but now I’m lifting my head up to be ready for that next moment. It’s only been 12 days on the road and we are looking forward to the next 12! The time has come to hit the road! Our second national tour! Normally at this point, before heading out, we would have been filling the iPod with podcasts of “The Vinyl Cafe”. But this year, it might not make the playlist. Hearing Stuart McLean may not bring joy and optimism but rather a sadness – a reminder of his passing earlier this year. 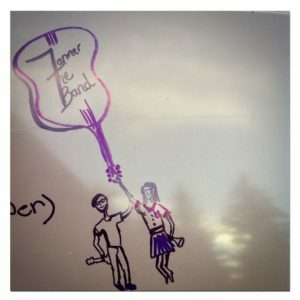 His voice became the soundtrack to Farmer The Band’s first tour across Canada. We cherished his welcoming address to the live audiences, describing the subtleties and nuances of their own backyards. That brought an excitement to us, looking at our tour schedule, knowing that we will be visiting some of those same places. Once we got there, it also brought a sense of accomplishment and connection after witnessing and experiencing the exact same things Stuart so vividly painted in our minds. He read letters from his devoted fans during The Vinyl Cafe’s “Story Exchange” like they were his own. He read them so well that we felt the heartache and struggles as if they were our own. But we also shared the joy and the hope that Stuart pulled out of every story. Then, of course, the adventures of Dave and Morley would start. What predicament will Dave get himself into this week? Will we be laughing aloud like when Dave gets trapped in a storm drain, or will we be sitting in quiet empathy as Morley watches her daughter leave for college? In those moments that are so normal and everyday, or so absurd yet so close to home, we realize we all have a bit of Dave and Morley – or Sam, Stephanie, even Mary Turlington! – in us. Not that any one of us has ever cooked an industrial grade Christmas turkey in a hotel, but we all have stories that – if told by Stuart McLean – would be more than normal and worthy of The Vinyl Cafe. But it wasn’t just the stories that made his show so good. There was good music – sorry, GREAT music. So many amazing musicians were able to be heard coast to coast on CBC Radio every week – Kathleen Edwards, Whitehorse, Joel Plaskett, Bahamas, Said The Whale, The Weakerthans, and one his favourite (and ours) Danny Michel, and many, many others. He didn’t just bring on established artists. He also found up and coming musicians and introduced them to new ears either on stage or during studio recorded episodes dedicated solely to music. We wanted to be one of those up and coming. Maybe that’s really why our podcast playlist might not include Stuart McLean. So where do we go from here? Yes, it was a dream of ours to be the musical guest on The Vinyl Cafe. No, we will never grace the same stage with Mr. Mclean. But when it comes down to it, every time Stuart introduced the musical guest and the music started to play, it gave us inspiration to write and perform our songs, to follow our dream of being musicians, to go out on tour. The sincerity in his voice and his openness gave us inspiration to share ourselves, our ups and downs, our normal and our absurd. He gave us inspiration to share… our stories. So, this tour, maybe our final destination of The Vinyl Cafe has changed, but our soundtrack doesn’t need to. Looking forward to being back on the road with you, Stuart.